My husband doesn’t quite get it. He grew up in California. He just doesn’t get the anticipation of heading over the Causeway, rolling down the windows to take in the intoxicating salt air, antsy to wiggle our toes in the sand. It’s a shore thing. Ever since I was little my family would make an annual pilgrimage down the shore. Jersey shore that is. I now travel 3000 miles to wiggle my feet in the white sands of Long Beach Island and to share it with my West Coast kids. My husband still thinks I’m nuts, but he’s beginning to get the connection between the shore and family fun. 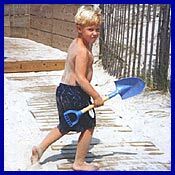 We load up on sun block, sand toys, boogie boards and adventure novels and do the pilgrimage for a week every August. 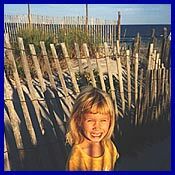 On Long Beach Island (LBI) we head to Beach Haven – once the historic center of LBI – now a lovely beach town that offers family friendly restaurants, inns, activities, and one incredible white sand beach. Six miles out to sea, this barrier island is eighteen miles long and less than a quarter of a mile wide. You can rent a beach house or cottage, a condo, or stay in one of the numerous motels that dot the island. Our favorite spot is Windward at the Beach, just set back from the beach, right in Beach Haven. An old Victorian, it has been divided into small efficiency apartments, some with complete kitchens. The favorite units include two rooms (love that privacy). They offer surprise treats throughout the day, kid fun packs, and a wonderful enclosed porch full of books and games. Unlike the other B&Bs, they welcome families, even providing a huge bucket of beach toys. Another wonderful feature is the outdoor dining areas, with patio tables and gas grills. It makes for an affordable stay. Beach badges are required at most beaches on LBI. Be sure to ask if they are included when you book a room. We loved getting out early to enjoy the empty beach. You can walk for miles (18 to be exact), picking up shells and playing in the waves. Check the tide table for low tide. It’s a great time to play in the tide pools or venture out to the sand bar. The waves are small and perfect for learning how to body surf. Boogie boards are available for rent – or to buy – at reasonable prices at numerous surf shops. Though traffic can be a problem on weekends, if you get out early you can enjoy the flat roads for Roller Blading or bike riding. We rented bikes at A.J.’s on Pearl Street and headed to Holgate every morning. If your little one is between a bike seat and a bike of his own, try a Tag-a-Long, which hooks on to your bike. My four-year-old loved it. She pedaled when she wanted to but could kick back and enjoy the ride when she got tired. There are all kinds of activities for families. The kids will love fishing off the Center Street Pier (we never did catch anything) or crabbing or clamming in the bay. You are going to have to give in to a stop at Fantasy Island’s arcade and amusement park. (small rides, miniature golf, water park). Go early and look for Friday specials and discount coupons. Wednesday evenings there are some concerts in Centennial Park (kind of hokey, but the kids love to run around). A must is the Surflight Theatre for children’s theater. The play changes weekly and young kids will love the live presentations of Disney’s favorites. There is no assigned seating so arrive early (there will be a line) for best seats. Top off the evening with an ice cream soda at the Show Place next door. Indeed a show, singing waiters and waitresses interact with patrons who must sing for their sweets. If you refuse to participate (yeah that was me), the whole place will point their fingers at you and sing, "Every party has a pooper and that’s why we invited you. Party pooper…." The kids love it. For something a little different (and yes educational), try some of the Alliance for Living Ocean’s activities. 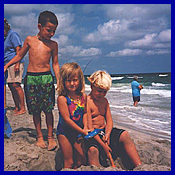 They encourage appreciation for the ocean and ocean life with various family programs. Kid’s Stories by the Sea, Inherit the Earth Tours, Eco Tours and Inlet Lore are but a sampling of the weekly events. Family dining is simple in Beach Haven. The "din factor" is high at Buckalew’s, Tuckers and the bayside Boat House. Don’t skip pancakes at Uncle Will’s and for lunch try the Holiday Snack Bar on Center Street. Bay Village is worth a stop. Allocate some time to explore the Dollar Parlour and to binge on some homemade fudge. We didn’t have time to explore the bay by boat but there are plenty of options. The Black Whale III has scheduled tours that depart from Engleside Avenue, tour the bay to the inlet, and even let your little one captain the boat. Or you can go it on your own by sailboat or powerboat or even rent a kayak for a quiet paddle amid the tiny reed islands. Most boat traffic is confined to the bay as the ocean side is quite rough. Rain is a fact of life on the Jersey Shore. If you are lucky, you’ll get a smattering of thundershowers and avoid the Nor' Easters that can blow through. The kids loved watching the thunderclouds over the bay with ragged lightening strikes vivid against the sky. We hung out one rainy day, sloshed through the puddles, played Monopoly and Battleship and read scary stories. It reminded me of those lost family days when I was a kid. And that's what a family trip down the shore is all about. It’s family time without all the trimmings and trappings of a theme park, just the beach, some surf and some fun. And a little ice cream from the Frosted Mug. Yum. For more info on LBI click here or call (800)292-6372. For more info on Windward at the Beach click here or call (609)492-4468. The Best of Everything at the Jersey Shore, by Jeff Edelstein. Where should you go for a great breakfast, or a fantastic ice cream sundae? Want to explore a lighthouse, take a shorefront bike trip, or catch a sunset over cocktails? Get this, and other great info, in thiis book offered in partnership with Amazon.com. It received a 5-star review by its readers! Click here to purchase this book.